I went to my hometown this weekend and who was on the platform beside me as I was waiting for the train to come in? 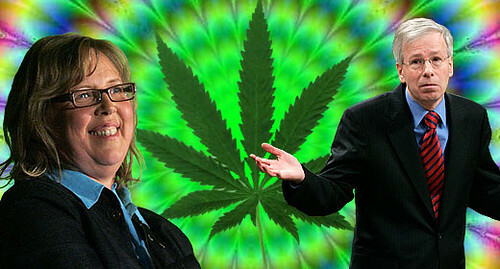 Well if it wasn’t Elizabeth May, the leader of Canada’s federal Green Party! I bet Stéphane Dion and Jack Layton don’t take VIA Rail. Her partner or husband was there to see her off, which reminded me of the fact that Stephen Harper doesn’t hug his children, but rather shakes their hands. I kind of regret not introducing myself to Ms. May. I’ve read her book “How to Save the World in Your Spare Time” and I’ve seen her speak at Queen’s University. I’ve actually seen a bunch of politicians speak live, and she was the only one who actually answered the questions she was asked in the Q & A periods. She’s very real and very interesting. She was traveling with a fluorescent green suitcase.